Seminars – Emergence of de novo protein coding genes from ‘dark genomic matter’ — fact or fiction? Emergence of de novo protein coding genes from ‘dark genomic matter’ — fact or fiction? Proteins are the workhorses of the cell and, over billions of years, they have evolved an amazing plethora of extremely diverse and versatile structures with equally diverse functions. Therefore, their evolution echoes the evolution of all forms of life. Evolutionary emergence of new proteins and transitions between existing ones are widely believed to be rare or even impossible. However, recent advances in comparative genomics have repeatedly called some 10%-30% of all genes without any detectable similarity to existing proteins. Even after careful scrutiny, some of those “orphan” genes contain protein coding reading frames with detectable transcription and translation. Thus some proteins seem to have emerged from previously non-coding ‘dark genomic matter’. These ‘de novo’ proteins tend to be disordered, fast evolving, weakly expressed but also rapidly assuming novel and physiologically important functions. I will review mechanisms by which ‘de novo’ proteins might be created, under which circumstances they may become fixed and why they are elusive. I will present a couple of studies which mostly focus on metazoan genomes. Publication – Real-time whole-genome sequencing for surveillance of Listeria monocytogenes, France. Real-time whole-genome sequencing for surveillance of Listeria monocytogenes, France. During 2015-2016, we evaluated the performance of whole-genome sequencing (WGS) as a routine typing tool. Its added value for microbiological and epidemiologic surveillance of listeriosis was compared with that for pulsed-field gel electrophoresis (PFGE), the current standard method. A total of 2,743 Listeria monocytogenes isolates collected as part of routine surveillance were characterized in parallel by PFGE and core genome multilocus sequence typing (cgMLST) extracted from WGS. We investigated PFGE and cgMLST clusters containing human isolates. Discrimination of isolates was significantly higher by cgMLST than by PFGE (p<0.001). cgMLST discriminated unrelated isolates that shared identical PFGE profiles and phylogenetically closely related isolates with distinct PFGE profiles. This procedure also refined epidemiologic investigations to include only phylogenetically closely related isolates, improved source identification, and facilitated epidemiologic investigations, enabling identification of more outbreaks at earlier stages. WGS-based typing should replace PFGE as the primary typing method for L. monocytogenes. The RpoS/σS sigma subunit of RNA polymerase is the master regulator of the general stress response in many Gram-negative bacteria. Extensive studies have been conducted on σS-regulated gene expression at the transcriptional level. In contrast, very limited information regarding the impact of σS on global protein production is available. In this study, we used a mass spectrometry-based proteomics approach to explore the wide σS-dependent proteome of the human pathogen Salmonella enterica serovar Typhimurium. Our present goals were twofold: (1) to survey the protein changes associated with the ΔrpoS mutation and (2) to assess the coding capacity of σS-dependent small RNAs. Our proteomics data, and complementary assays, unravelled the large impact of σS on the Salmonella proteome, and validated expression and σS regulation of twenty uncharacterized small proteins of 27 to 96 amino acids. Furthermore, a large number of genes regulated at the protein level only were identified, suggesting that post-transcriptional regulation is an important component of the σS response. Novel aspects of σS in the control of important catabolic pathways such as myo-inositol, L-fucose, propanediol, and ethanolamine were illuminated by this work, providing new insights into the physiological remodelling involved in bacterial adaptation to a non-actively growing state. Publication – Listeriomics: an Interactive Web Platform for Systems Biology of Listeria. Listeriomics: an Interactive Web Platform for Systems Biology of Listeria. As for many model organisms, the amount of Listeria omics data produced has recently increased exponentially. There are now >80 published complete Listeria genomes, around 350 different transcriptomic data sets, and 25 proteomic data sets available. The analysis of these data sets through a systems biology approach and the generation of tools for biologists to browse these various data are a challenge for bioinformaticians. We have developed a web-based platform, named Listeriomics, that integrates different tools for omics data analyses, i.e., (i) an interactive genome viewer to display gene expression arrays, tiling arrays, and sequencing data sets along with proteomics and genomics data sets; (ii) an expression and protein atlas that connects every gene, small RNA, antisense RNA, or protein with the most relevant omics data; (iii) a specific tool for exploring protein conservation through the Listeria phylogenomic tree; and (iv) a coexpression network tool for the discovery of potential new regulations. Our platform integrates all the complete Listeria species genomes, transcriptomes, and proteomes published to date. This website allows navigation among all these data sets with enriched metadata in a user-friendly format and can be used as a central database for systems biology analysis. IMPORTANCE In the last decades, Listeria has become a key model organism for the study of host-pathogen interactions, noncoding RNA regulation, and bacterial adaptation to stress. To study these mechanisms, several genomics, transcriptomics, and proteomics data sets have been produced. We have developed Listeriomics, an interactive web platform to browse and correlate these heterogeneous sources of information. Our website will allow listeriologists and microbiologists to decipher key regulation mechanism by using a systems biology approach. Overview. In this course we introduce web-based tools to analyse and interpret high-throughput biological data. In the main focus will be g:Profiler – a toolset for finding most significant functional groups for a given gene or protein list; MEM – a query engine allowing to mine hundreds of public gene expression datasets to find most co-expressed genes based on a query gene; and ClustVis – a web tool for visualizing clustering of multivariate data using Principal Component Analysis plot and heatmap. Audience. 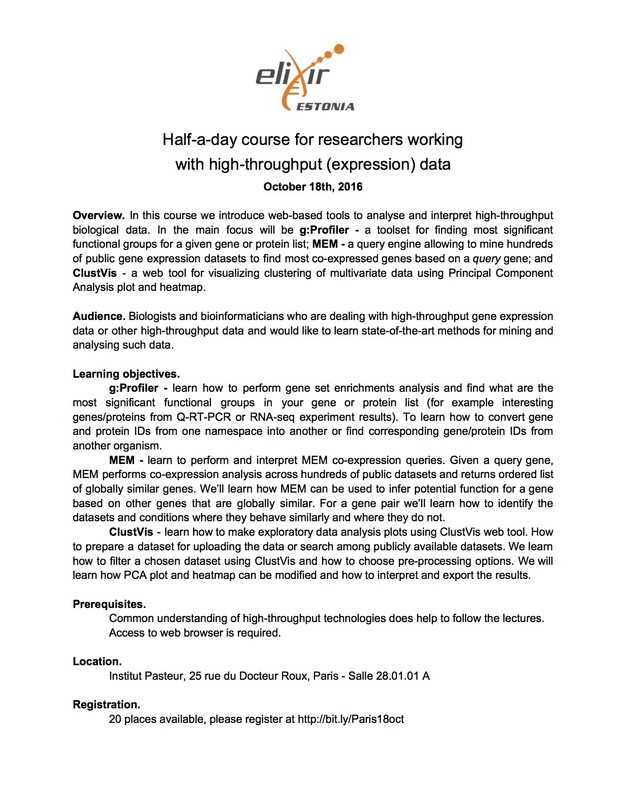 Biologists and bioinformaticians who are dealing with high-throughput gene expression data or other high-throughput data and would like to learn state-of-the-art methods for mining and analysing such data. Learning objectives. g:Profiler – learn how to perform gene set enrichments analysis and find what are the most significant functional groups in your gene or protein list (for example interesting genes/proteins from Q-RT-PCR or RNA-seq experiment results). To learn how to convert gene and protein IDs from one namespace into another or find corresponding gene/protein IDs from another organism. MEM – learn to perform and interpret MEM co-expression queries. Given a query gene, MEM performs co-expression analysis across hundreds of public datasets and returns ordered list of globally similar genes. We’ll learn how MEM can be used to infer potential function for a gene based on other genes that are globally similar. For a gene pair we’ll learn how to identify the datasets and conditions where they behave similarly and where they do not. ClustVis – learn how to make exploratory data analysis plots using ClustVis web tool. How to prepare a dataset for uploading the data or search among publicly available datasets. We learn how to filter a chosen dataset using ClustVis and how to choose pre-processing options. We will learn how PCA plot and heatmap can be modified and how to interpret and export the results. Prerequisites. Common understanding of high-throughput technologies does help to follow the lectures. Access to web browser is required. Please bring a laptop, to be able to use the tools. Participants are very welcome to bring their own gene/gene list of interest, to analyse them during the session. Publication – Phylogenomic analysis supports the ancestral presence of LPS-outer membranes in the Firmicutes. Phylogenomic analysis supports the ancestral presence of LPS-outer membranes in the Firmicutes. One of the major unanswered questions in evolutionary biology is when and how the transition between diderm (two membranes) and monoderm (one membrane) cell envelopes occurred in Bacteria. The Negativicutes and the Halanaerobiales belong to the classically monoderm Firmicutes, but possess outer membranes with lipopolysaccharide (LPS-OM). Here, we show that they form two phylogenetically distinct lineages, each close to different monoderm relatives. In contrast, their core LPS biosynthesis enzymes were inherited vertically, as in the majority of bacterial phyla. Finally, annotation of key OM systems in the Halanaerobiales and the Negativicutes shows a puzzling combination of monoderm and diderm features. Together, these results support the hypothesis that the LPS-OMs of Negativicutes and Halanaerobiales are remnants of an ancient diderm cell envelope that was present in the ancestor of the Firmicutes, and that the monoderm phenotype in this phylum is a derived character that arose multiple times independently through OM loss. The survival of DNA molecules in long-dead fossil material offers a unique opportunity to catch evolution red-handed at the molecular level. This research area emerged in the mid-1980s and was for the first 25 years of its history, limited to the analysis of extremely limited genetic information. Recent technological breakthroughs have opened access to the complete genome sequence of ancient individuals and extinct species, such as the woolly mammoth and Neanderthals, and enhanced the time window for genome sequencing to at least one million years in permafrozen regions and half-a-million years in temperate caves. The information present in ancient genomes has considerably changed our understanding of the recent evolution of our own species, directly revealing patterns of population migration, admixture, selection and extinction. Additionally, the genetic characterization of ancient pathogens has unveiled the etiological agents of massive historical outbreaks, and the evolutionary arm race that progressively transformed such pathogens into massively deadly killers. Ancient DNA also helped track how humans became an evolutionary force, modifying their environment and transforming multiple animal and plant species into domesticates. As a diversity of past plant, bacterial, fungal and animal DNA material are still preserved in sediments and ice cores, ancient DNA can reveal how ancient communities and ecosystems were reshaped in the face of major environmental crises, thereby illuminating our understanding of ecological interactions and extinction processes. Ancient microbiomes, in particular the oral microbial communities, can also be reconstructed, providing a unique opportunity to follow the changes possibly introduced by recent cultural changes in our life-style. Beyond genomes, the profiling of epigenetic landscapes has become feasible and genome-wide nucleosome and methylation maps from past organisms have been reconstructed, paving the way for evaluating the evolutionary role of epigenetic reprogramming. I will present key developments in this recent revolution in ancient DNA research, using examples from my own research. In computational biology, a fundamental question is the extraction of evolutionary information from DNA sequences. Here, we consider protein sequences and structures. Given a family of protein sequences and the associated distance tree, we shall explain how a fine reading of the conservation and co-evolution signals between residues in sequences can be used to identify protein binding sites, mechanical and allosteric properties, protein-protein interactions. Based on this novel approach to coevolution analysis, we reconstructed the protein-protein interaction network of the Hepatitis C Virus at the residue resolution. For the first time, coevolution analysis of an entire virus was realised, based on a limited set of protein sequences with high sequence identity within genotypes. The identified coevolving residues constitute highly relevant predictions of protein-protein interactions for further experimental identification of HCV protein complexes. The method can be used for interaction predictions for other viral protein interaction networks.